This Guide is meant to engage with self injury from a Christian context. There are few resources around for Christians who want to understand self injury – I will be pointing out those resources I have been able to find – and the church remains a place where the self injurer (or anyone with a mental disorder) is likely to face stigma and discrimination based on our understanding, not only as members of our society, but as Christians, of self injury. I myself self injured, starting at age fourteen and continuing for a number of years. I would describe myself as being in recovery from self injury – I have gone some time without doing it, but I wouldn’t describe myself as “recovered” at the present time. I still have urges to do it, and I bear numerous scars from the cutting I did. I hope this Guide is useful, as I will engage with some Christian misconceptions about self injury (that it is forbidden in the Bible, that it is a sign of demonic possession/oppression) as well as describe what I know about it, why it happens, and things that can be done. 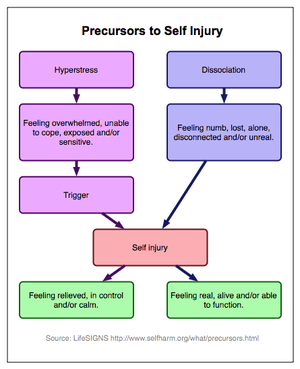 I use the term “self injury” most frequently, although I occasionally use the term “self harm”. This is simply because when I was first learning about self injury, when I first began doing it myself, most websites by sufferers used the term “self injury” rather than any other. A note on abbreviations: I will try, in these posts, to explain abbreviations in those posts, but there are some words I am likely to abbreviate frequently. I use “SI” as an abbreviation for “self injury,” and the only other regular abbreviations I am likely to make are for the Bible version I use, where NIV stands for New International Version (2011). I just recently learned from my daughter (who is now 19) that she was cutting herself for some time a few years ago. I’m still not sure how long it went on or when she stopped. It sounded like she felt angry because the signs were right in front of us and we just “ignored” them, that she was trying to reach out for help but we didn’t respond. I tried to explain to her that I honestly had no clue she was doing that and that I felt bad that we didn’t know she was hurting. I told her it would be like someone talking to you in a strange language that you don’t know, and you just hear noise but don’t recognize it as a language or know how to interpret it because it is a language that is not familiar to you. Now that this has come out it has opened the door for us to start to repair our relationship with her, for which we are very grateful. We told her we were really proud of her for telling us and were glad she did. If you cannot see my pain? Things get a lot better once it is out in the open, and the issues that caused it can be addressed. I haven’t self harmed anywhere near as much since I became open about it.